Week 5 of the Spelling Words Program teaches students about sight words, words with suffix -able, and academic vocabulary. The spelling words for this week are made up of: beetle, jewelry, avenue, climb, wrote, Minnesota, continue, launch, active, passive, sprint, allowable, suitable, distinguishable, preferable, debatable, matter, gaseous, solidify, and petroleum. For each day of the school week, students will have a printable spelling activity to work on. 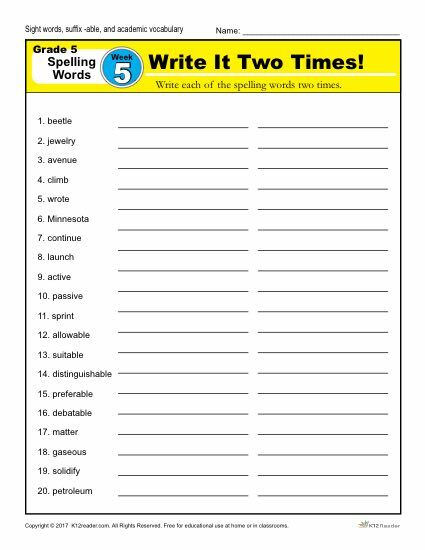 These worksheets include: Write it Two Times, Dictation Sentences, Circle the Correct Spelling, Write a Sentence: Part 1 and Write a Sentence: Part 2. Find the spelling words for week 1 through week 36 by viewing the master list. Click here!